The subject today is the min-raise — that is, somebody bets, and you submit a raise that is exactly double that amount, which is the smallest raise you can make in a no-limit game. I want to address this very specific tactic because I see it used way too much by relatively inexperienced players. I’d like to explain why it’s usually the wrong move. Note: A min-raise is a popular preflop opening move these days in high-level tournament play, with solid game-theory math to support it. But here I’m talking about postflop play in cash games, against less sophisticated opponents, which makes it a whole different animal. I was playing a $1/$2 game at the Golden Nugget in Las Vegas a few years ago. In early position, I had and raised to $8. Three players called. The flop was . I figured that with the nut flush draw, that flop likely helped me more than any of the others, so I bet $20. One player folded, the next min-raised to $40, and the third folded. Let’s do some math here. The pot was now about $90, and it would cost me $20 to call, making pot odds of 4.5-to-1. Will I make my flush on the turn? Well, there are 9 hearts remaining out of the 47 unknown cards, so the probability is 9/47, or about 19%, which translates to about 4.2-to-1. This means that even if I have no implied odds (i.e., if he won’t put in any more money if I make the flush), it is mathematically correct for me to call trying to hit. If he has a hand with which he will lose more when I complete my hand, a call is even more profitable. I called, then I got lucky — the turn was the . I checked, planning a check-raise. (In retrospect, a lead-out bet may have been a better plan, but that’s a subject for another day.) He disappointed me by checking behind. The river was the , which could not improve any hand with which he would have raised on that flop. I bet $55 into the $110 pot. He thought for a long time before reluctantly folding his face-up. I think this hand perfectly illustrates the main problem of the min-raise: It almost never accomplishes whatever goal the raiser had in mind. 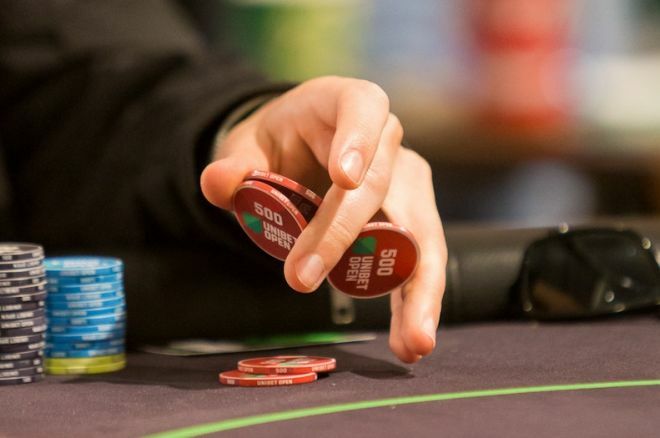 It makes sense to raise in order to make other players pay more than they mathematically should for a draw to a flush or straight, but a min-raise probably won’t do that. You might min-raise as a bluff, but that size looks so weak that it will likely get a call from anybody whose bet was not itself a pure bluff. A player with good reading skills might reraise you with nothing, just because the min-raise looks so weak. Perhaps the most common reason for a raise is to build a big pot with a strong hand. Surely it’s obvious that the smallest possible raise is usually not the way to build the biggest pot. Now let me tell you another story, this one from a low-stakes (20-cent blinds) home game I played in just a few weeks ago. The final board was , with no flush possible. A young woman bet $5, which was about the size of the pot. I’ve played with her enough to know that she loves bluffing in situations like this, where nobody will dare call unless they have a specific card — in this case, an . I had just one pair, but when the only other player in the hand folded, I thought it was a great spot for a re-bluff. I raised all-in, about $30. She instantly called and flipped over not just an , but , for the stone-cold nuts. Oops. In retrospect, I still think raising was correct, because she will more often be bluffing than value-betting here. What I got wrong was my bet-sizing. This is one of the rare situations where a min-raise would be perfect. If she has nothing, she will just fold, because she’s not brave enough to make an all-in re-bluff. Put another way, any raise size will win me the pot if she’s bluffing, but with a min-raise I lose the least if I’m wrong and she either calls or reraises. You have a monster hand, know that an opponent is weak, and a minimum raise is the most you can possibly hope to squeeze out of him. You have an overly aggressive opponent whom you have reason to believe will read a min-raise as weak, when you actually have him crushed. Here the min-raise is a trap that you hope will induce a reraise. You have a lock on the hand (top full house, quads, etc.) and a whole raft of loose callers to somebody’s initial bet; a min-raise may be the best way to swell the pot by giving every single one of those callers temptation to put more chips in when they’re drawing dead. But as you can see from that list, the spots in which a min-raise is optimal are few and far between. It’s a specialty tool — like a sand wedge in golf. It’s great to have it in your bag when you need it, but it’s a bad choice in most ordinary situations. If you have been in the habit of using a min-raise commonly, be bold and try instead a raise of perhaps 3 to 3.5 times the bet. I suspect you’ll find that it does a better job of making you money.